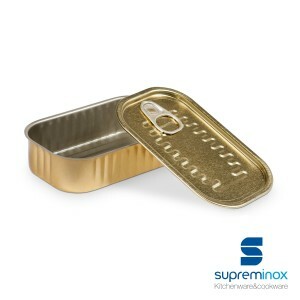 These are the Supreminox snack tins – a complete line in professional tableware specialising in the unique and stylish presentation of tapas, appetisers and snacks – in tins designed exclusively for the catering sector. 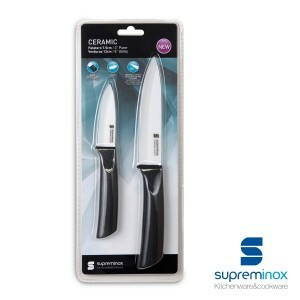 Surprise your customers and dinner guests with your own very different and personal style – provided to you by the new Supreminox snack tins. A way of transforming traditional service with an innovative, original touch that will surprise everyone. The snack tins have the distinctive feature of looking like typical tins designed for the food sector, therefore offering a traditional product with a very different touch that your customers will sit up and notice. 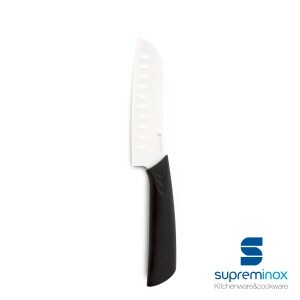 This tableware sparks comment; it is designed for the presentation of tapas, garnishes and small servings as if you had just removed them from the tin. Ask for your estimate right now and choose the snack tins that best adapt to your needs. Mix and match them as you prefer! 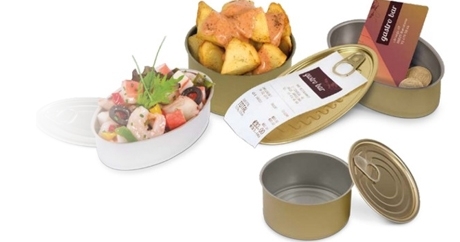 As tableware these snack tins are very versatile: they provide the professional with many options – there is a wide variety of shapes and sizes, and they can also be used to replace the traditional tip tray, when billing the customer. This is an attractive catering accessory that can instantly resolve the presentation of your everyday snacks by making them more lively and appealing. 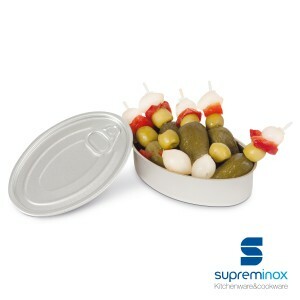 In short, whether round or oval, our snack tins are perfect catering accessories for bars and restaurants; they are suitable for serving all kinds of food and are designed in practical rounded shapes, which can be easily adapted to present all types of tapas and servings. 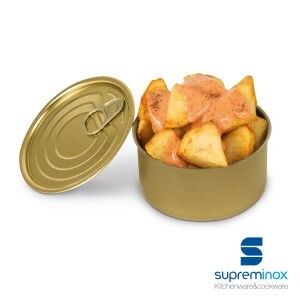 The Supreminox snack tins come in attractive copper and aluminium finishes. They will not go unnoticed. Discover them here!